Crackers with a few simple toppings make easy bite-size appetizers. 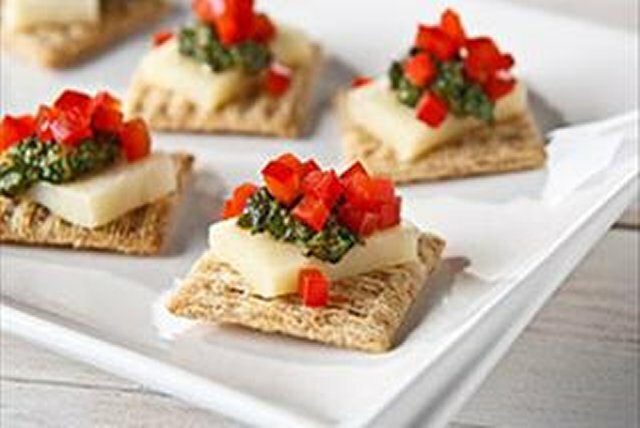 These cracker snacks are topped with Cheddar cheese, ready-made pesto and chopped peppers. Cut cheese slices in half. Make cheese and pesto trees! Cut cheese slices diagonally in half. Spread crackers with pesto. Top each with 2 cheese triangles to resemble a Christmas tree. Add chopped peppers for the tree decorations.